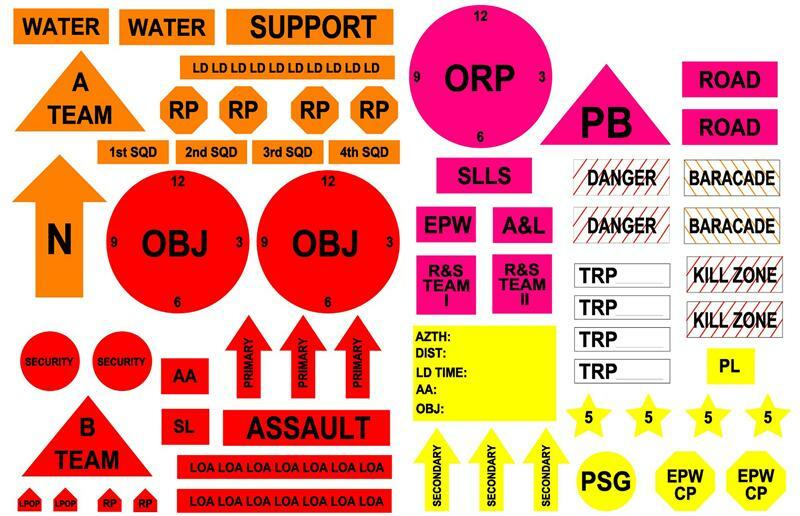 ﻿ ﻿ During the planning phase before every mission, you have to prepare and brief your entire Warning Order (WARNO) and Operations Order (OPORD) to your Soldiers. During the Execution paragraph, you will spend a long time going through every single step of the unit's movements and tasks -- and you'll do it on your sand table. A Terrain Model Kit is a portable map set you use to setup a model of the terrain you'll be covering during your mission. It has to have everything you need for every type of mission, as well as additional pieces that help you to model obstacles and terrain features you expect to see. An extra set of alcohol markers and eraser -- keep them in the kit and don't use them for anything else or you'll lose them. Ten feet of colored yarn -- at least five different colors. You can use cord, which is thin but durable, or knitting yarn, which tends to fray over time. I recommend going to a craft store (Michael's, Hobby Lobby, etc.) where they sell the yarn on arge spools and you can cut off and buy only what you need. Thick sticks of sidewalk chalk -- you'll scrape these with your knife to fill in water, greenery, etc. Index cards, cut into quarters and laminated. You can use these smaller squares to show landing zones, linear danger areas, target reference points, and a heck of a lot more. I would make at least 20 of them. Have additional ideas? Put them in the comments below! I like the Idea of permanently Laminated Index Cards. Very good write up. When I started looking around, there were very few on the market worth buying; however, I did find a company (www.myleadersource.com) that sells a Squad, Platoon and Company version. It is very professional and worked well. They also have a Perimeter Defense Kit that works great for sector sketches. I highly recommend the platoon version. Pass Ranger! Earning the Tab.